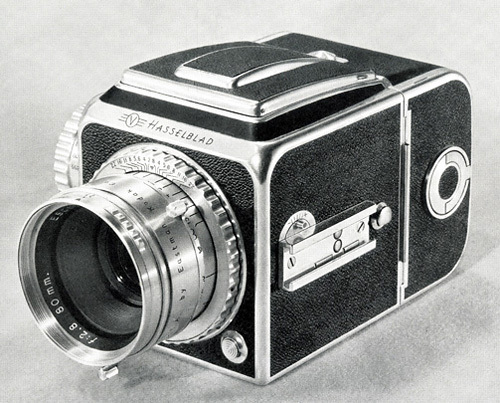 The first series of production cameras (“the civilian camera”) made by Victor Hasselblad was a challenging project. To bring engineering drawings and ideas of what, for the time, was a very complex camera into a functioning machine suitable for professional use must have been an extreme challenge. Two prototype bodies had been made in 1948 and one of these was used in the introduction of the Hasselblad camera in New York in October 1948. Manufacturing the cameras destined for public sale probably began in 1948 but with modifying and troubleshooting the parts and function took months and the first cameras were shipped to the US distributor in June 1949. 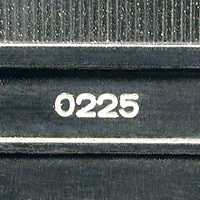 The cameras all bear a distinctive four digit serial number engravings ranging from 0001 to 0308. These first series cameras have a number of distinctive features that make them interesting technologically and historically. They are technical and historical equivalents of the 31 Barnack designed nullserie cameras made by Leica in 1923. These cameras were all essentially hand made with individual parts being fitted and modified to each camera. This makes repairs extremely difficult and extremely time consuming. Master Hasselblad repairman David Knapman reports that these early cameras can take 120 hours of his time to overhaul, clean, lubricate and adjust. To put that in perspective that is sitting at his workbench for three weeks working on one camera body to get it to function as it should! Because of this delicate and difficult mechanical design, many of these early cameras were returned to the factory for repairs - often within days of the new owners receiving them. Over the first few years of these cameras being sold, the majority (153 of 269 actually assembled) of these cameras came back to the factory for repairs and in many cases if the repairs were deemed too time consuming or parts were not available, the customer was simply sent a new camera. 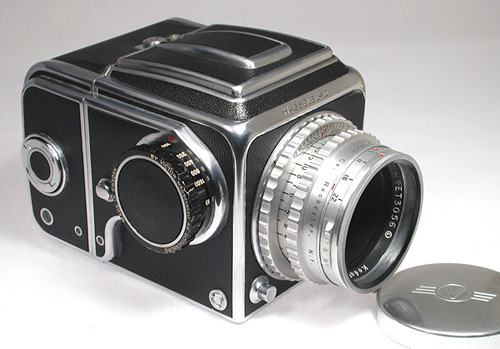 Many of the early cameras served as a source of parts after the series 2 cameras (1950-1953) with their modified internal mechanisms when they were being produced. However there are a number of the Series One cameras that have received a number of apparent upgrades that make them distinctive. 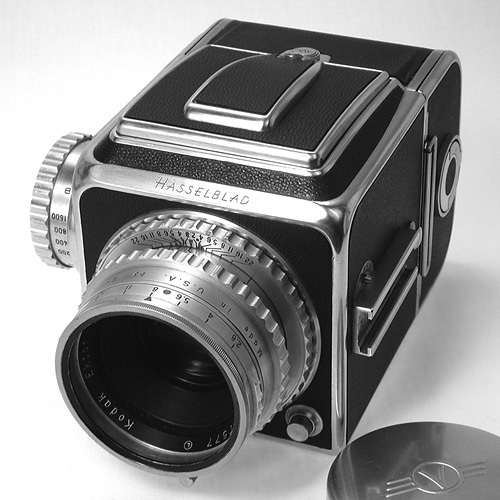 It is assumed that all of the Series One cameras were assembled with their most distinctive feature – a polished aluminum wind knob – in contrast with the black wind knob that all Hasselblad except this first series have. The shutter speed engravings on the wind knob are also different from the series two 1600F and 1000F cameras that follow as the shutter speeds are engraved with shorter exposure times running counter-clockwise as viewed from the right hand side of the body. See the photos below that show this difference. 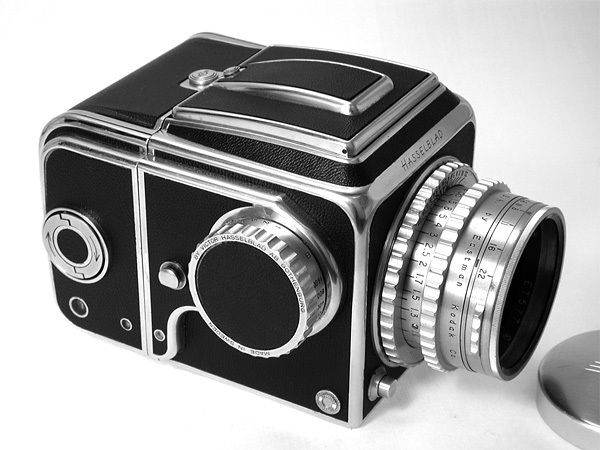 A few of these Series One cameras at present have black wind knobs. It is assumed that these were upgrades done at the factory. 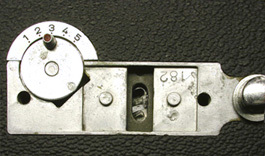 Some have the counter clockwise shutter speed engravings as the silver knobs have – implying that they have the original design (but presumably improved) mechanism inside. Others have been reported with a black knob with the clockwise engraving that is the same as the series 2 cameras and it is assumed that the entire internal mechanism was changed over. There are a number of early Series Two cameras that have been seen that seem to use a number of the parts from the Series 1 cameras and in some cases may have been converted from the early cameras. Distinctive Series One parts are the covers over the mechanism on the inside of the body adjacent to the mirror, the mirror assembly, the lens catch mechanism and other parts. The Series One camera body shells and internal chassis are all individually stamped. However it does not appear that the numbers stamped into the shell or the chassis were meant to match each other nor do they seem to match the serial number of the camera. They seem to be simply serially numbered as part of their manufacture. None of the Series two cameras seem to have this detail. Some of the early Series One cameras have the original style waist level finder that do not have the struts seen when the hood is opened and no release button and with small lifting grips on the back of the hood. The magnifier in these original waist level finders is not spring loaded, and to move it into viewing position it is necessary to pluck it upwards with thumb and index finger. Some early cameras also have the original dark slide without a handle. Both of these items seem to have been systematically replaced with their new improved versions when they were serviced so very few survive. 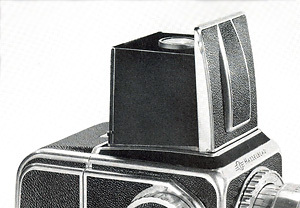 Images below are from an early Hasselblad brochure showing one of the prototype cameras. So in the light of 55 plus years of time and an initial imperfect design, very few of these Series One cameras have survived. Below is a table of the cameras I have seen or have good documentation on. It is not a long list! The most notable camera is 0001 which is noted in the ledger books as coming into the factory in 1985 for service! The camera is part of the collection of the Hasselblad Foundation, Göteborg, Sweden. U.S.A. Hasselblad Foundation, Göteborg, Sweden. counterclockwise engraving eBay, july 2010. 0259 CV 11678 ET 543 Silver wind knob U.S.A.
We would like to add to the list of survivor cameras, so if anyone has, or knows of a Series One camera, we would be pleased to hear from you! Text and photos copyright 2006, 2017 - Rick Nordin. All rights reserved.